They were like action replays of anguish yesterday as one by one the three teenage victims of Tyrone's saddest ever St Patrick's Day were buried. At their Requiem Masses the smiles on the covers of the orders of service shone out in chilling contrast to the sorrow etched on the faces of the thousands of people who came to mourn the trio. Hundreds of young friends of Morgan Barnard, Lauren Bullock and Connor Currie were inconsolable at the trilogy of tear-filled funerals which started early yesterday morning as Dungannon, Donaghmore and Edendork grieved for the "needlessly lost" lives of three vibrant and talented teenagers. One of them a passionate Irish speaker, another an energetic cheerleader and the other a promising Gaelic footballer. Scores of the children who witnessed the dreadful disaster at the Greenvale Hotel in Cookstown on Sunday night still looked shell-shocked as they filed into the three churches just a few miles apart. But for a smaller number of survivors the very thought of gathering again in a large crowd - even if it was in the more rarefied atmosphere of a church rather than a disco - was too much to even contemplate. So they stayed away or kept their distance, paying their respects from afar where the traumatic flashbacks to the Greenvale crush were lessened, albeit only slightly. One woman said: "My son couldn't face being in the middle of so many people again. "Obviously he didn't think that lightning was going to strike twice but once was clearly enough to make him frightened of crowds for the moment." The timing of Morgan and Connor's Masses meant that their friends from St Patrick's Academy could attend both services. The first funeral was in St Patrick's Church in the centre of Dungannon for 17-year-old Morgan, who died on the 43rd anniversary of the UVF murder of his great uncle Patrick who was just 13 when he was killed in a bomb attack which claimed three other lives. Outside the church yesterday pupils from several schools in Tyrone stood silently and solemnly in the rain waiting to form a guard of honour for Morgan, whose pregnant mother Maria's desolate cry was the only sound as the cortege approached the church with hundreds of mourners behind it. She was close to collapse and had to be held up by loved ones as she walked into St Patrick's behind her son's coffin. The Republic's Minister for Children Katherine Zappone was among the mourners as were Sinn Fein's Mary Lou McDonald, Michelle O'Neill and Michelle Gildernew. The Catholic Primate Archbishop Eamon Martin, who spoke at all three funerals, summed up the mood in Tyrone perfectly, likening the county to a valley of tears and he said: "Words fail us at times like this." His words proved prophetic at each funeral as friends who went forward to speak about the three victims struggled to get their words out, their voices breaking with the overwhelming emotion of the day and the week that preceded it. Local priest Fr Aidan McCann managed to bring a smile, however, as he remembered Morgan as a passionate Gaeilgeoir and joker who was humble and ready to help anyone who needed him. Morgan did voluntary assignments in his old primary school St Patrick's Dungannon sharing his passion for the Irish language with primary one children, and he also worked in a charity shop run by Cancer Research UK. Friends said Morgan was a "fun-loving teen" who liked to wear "flamboyant" shirts, a passion for fashion reflected by some of yesterday's mourners who were wearing colourful Hawaiian tops in tribute to him at the request of his family. Fr McCann said the new baby expected in the Barnard family home later this year "will know his or her brother by the stories of love they will hear about him". Floral tributes on a hearse outside the church were to a brother and a son, and friends also said farewell with flowers to the pal they called "Muscles", "Lad" or "Buddy". Another wreath was from Morgan's grandfather Anthony whose simple message said "Miss You". Just as Morgan's Requiem Mass was drawing to a close, hundreds of other mourners a couple of miles away in Donaghmore were joining 17-year-old Lauren Bullock's cortege from her home in Ivybank Park for the short journey to St Patrick's Church at the top of the village. Relatives said Lauren's pink and white coffin, with flowers painted on the sides, was chosen to mirror the colourful personality of the teenager who her priest said was a "girly girl" who was keen on football, scouting, socialising and most of all on her cheerleading. Members of her Euphoria Cheerleaders Group walked alongside their friend's coffin in their bright uniforms but many of them were clearly unable to cope, trying but not succeeding to fend off their tears in a downpour. Sinn Fein's Francie Molloy, who nearly broke down during TV interviews earlier in the week, was also a mourner. Tributes were paid to Lauren by a charity who are trying to raise funds for eight-year-old Armagh girl Katie Rose McKeown who is suffering from neuroblastoma, a rare type of cancer. Lauren was planning to climb Slieve Donard in the Mournes for the charity this day week. Referring to the Greenvale disaster, Donaghmore priest Fr David Moore told mourners St Patrick's Day 2019 would be remembered for decades to come as "an awful day when three beautiful young people were overpowered, literally in the mad rush of our modern world, and needlessly lost their lives". 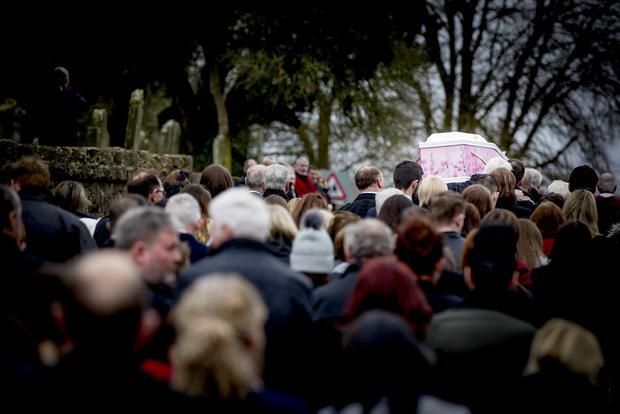 As mourners for Lauren and Morgan criss-crossed the Dungannon area for their burials, others went to a quiet rural hamlet outside the town to show their support for the family of the youngest victim of Sunday's tragedy, Connor Currie. 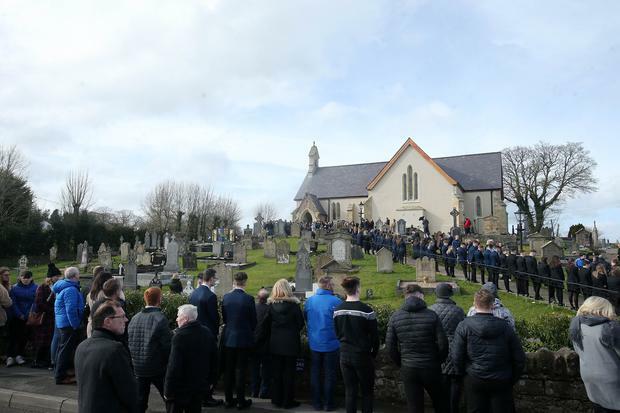 The mourners travelled the mile-and-a-quarter from the 16-year-old's Mullaghmarket Road home to St Malachy's Church on the road between Dungannon and Coalisland. Dozens of St Patrick's Academy pupils lined the path up to the church and at the bottom of the hill Connor's colleagues from Edendork GAA club, in their distinctive yellow-and-green jerseys, linked arms and formed a huddle for the last time around their friend, who was described as a "star on the football field". As they broke away to attend the Mass it was clear that the poignant gesture had left some of the footballers distraught. Father Kevin Donaghy spoke warmly of Connor's infectious smile and his courteousness which he said was sometimes mixed with mischief. The priest's homily also echoed what had been said at the two earlier masses - that the victims all had bright futures ahead of them, with Connor already focusing on becoming an accountant. Tyrone GAA star Niall Morgan, who has also played football for Dungannon Swifts, read a poem during the Mass after the priest revealed that Connor had a foot in two rival Gaelic football camps, having been born in Armagh but raised in Tyrone. Fr Donaghy said: "He recently went to the McKenna Cup Final with his Tyrone top on but before leaving he let his Armagh-born mother have a peep to see that he had an Armagh top on underneath the Tyrone one - Connor was going to be a winner either way!" It was one of the few lighter moments in a harrowing day in Tyrone during which there were repeated warnings from the clergy that the grieving process is only just beginning for many of the young friends of the three victims. There were calls, too, for parents and teachers to keep an eye on the survivors in the difficult weeks and months ahead. For while the priests were said to be attempting to tend to the spiritual needs of the teenagers who witnessed the Greenvale tragedy, it was stressed that the mental scars will take a long time to heal.